Deliciously rich and comforting, this Slow Cooker Pork & Sage Ragu is one of my new favourite recipes. This recipe needs minimal effort but is the perfect dish for a cold evening. This Slow Cooker Pork & Sage Ragu is my pork version of a ragu you would usually have as spaghetti bolognese. If you follow my blog, you’ll know pork is my favourite meat. So naturally I wanted to make a pork version of a recipe I already love. 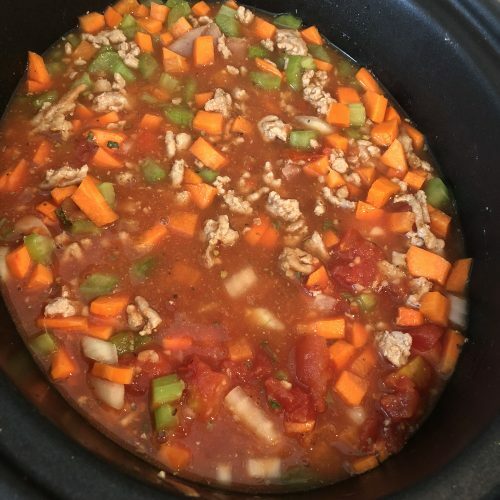 You will see the resemblance to the typical ragu, but also the changes I have made. 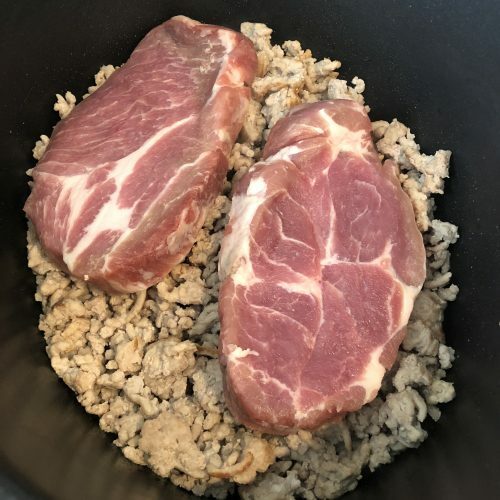 I wanted to use two different cuts of pork to bring different textures to the dish. I especially like the texture the pork shoulder brings to the dish and it makes the dish more exciting than just mince. Sage is a classic combination with pork and works really well in this Slow Cooker Pork & Sage Ragu. I have used a mix of fresh and dried sage because I like using fresh herbs when I can, but like the convenience of dried herbs. If you don’t have fresh sage, you can use just tried thyme but add slightly less before tasting and adding more if needed. 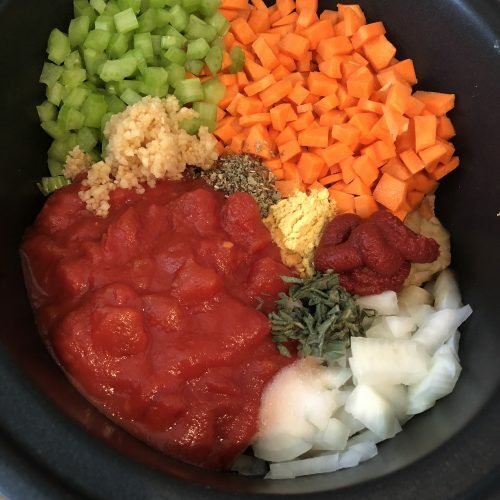 This Slow Cooker Pork & Sage Ragu freezes really well. I made a batch of this to keep in the freezer which when defrosted makes a fantastic week night dinner served with pasta. It’s a fantastic no fuss meal that it sow comforting and tasty. Take the pork shoulder out of the slow cooker and shred it before adding it back. Stir thoroughly. Do not skip the browning of the mince step as it will alter the texture of the final dish. 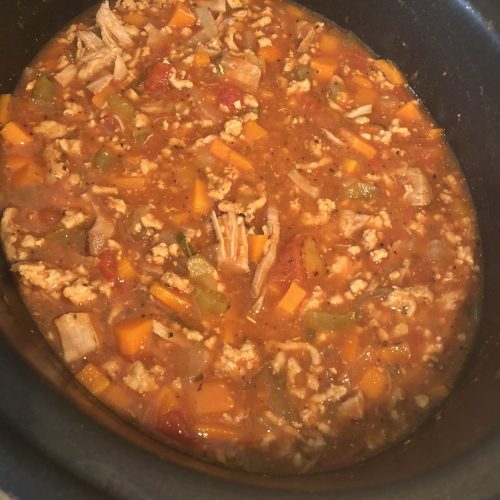 This entry was posted in Slow Cooker, Dinners on November 11, 2018 by Curly. Virtual high five on the pork, girl! Pork shoulder is just glorious in a ragu like this. What a fantastic midweek meal! It looks delicious and I especially like how you’ve included 2 different types of pork. It’s a lovely idea to have the shredded pork as well as the mince. Thanks for sharing with #CookOnceEatTwice! Thanks, double pork is the only thing better than pork in my opinion! This is perfect for my family where 3/4 of us miss a good ragu because the remaining person does not eat beef. This is the answer to our prayers. This pork version looks lovely and rich & I love the sage in there too. Perfect warming recipe for the cold evenings that are soon going to arrive! Well you know how much I love my slow cookers so this is the perfect recipe for me. We hardly ever have pork so this will be a lovely dish for us to try! I hope this broadens your pork horizons haha. You can’t go wrong with a good ragu recipe! It’s always needed and always a huge hit with the family! What a delicious, warming dinner. I recently cooked pork shoulder steaks for the first time and I was kicking myself for not trying them sooner! The meat is so tender. Ooh delicious! I can’t get enough of pork!